Here's a recipe idea to use your pumpkin and dried cranberries this holiday season. 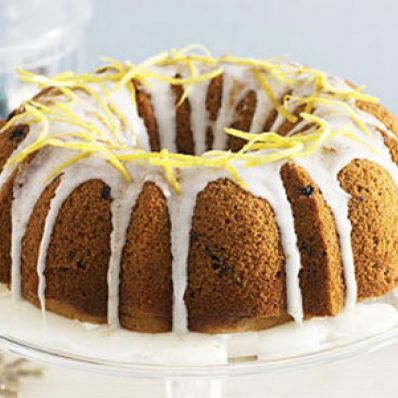 This eye-catching cake, made in a fluted tub pan, makes a lovely presentation on any table. 1 of 5 Heat oven to 350 degrees F. Butter and flour a 12-cup bundt pan. Set aside. 2 of 5 In a large bowl, whisk together flour, pumpkin pie spice, baking powder, baking soda and salt. Set aside. 3 of 5 Beat butter until smooth. Add sugar; beat until fluffy. Beat in eggs, one at a time, beating well after each addition. Add pumpkin and vanilla. Beat until combined. 4 of 5 On low speed, beat flour mixture into butter mixture in three additions, alternating with milk. Beat 2 minutes on medium-high. Fold in cranberries. Spoon into prepared pan. 5 of 5 Bake at 350 degrees F for 55 minutes or until a toothpick inserted in the center of the cake comes out clean. Cool in pan on wire rack for 20 minutes. Run a knife around edge of the pan. Turn out; cool completely. 1 of 1 In a small bowl, mix together confectioners' sugar, corn syrup and lemon juice until smooth. Drizzle over top of cake and allow to drip down the sides. Garnish with lemon peel and pumpkin pie spice, if desired.